Swivel Couplings | Kiowa Ltd.
Torsion protection that can be fitted along the line – universally deployable for hose lines that are moved at regular intervals, such as those in loading, filling, and tanking systems or mixing stations. DN 13 to DN 100. ECTFE coating for aggressive media. Female thread and/or male thread. -20°C to 120°C, dependent on sealant. Lower or higher temperatures also possible. 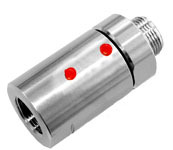 Reliable even at the lowest pressure. Torsion protection that is fitted directly in the hose – universally deployable for hose lines that are moved at regular intervals, such as those in loading, filling, and tanking systems or mixing stations. DN 13, DN 19, DN 25. -20ºC to 100ºC dependent on sealant. 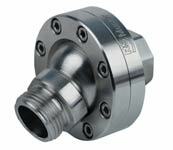 Torsion protection that can be fitted along the line with industrial bearings. 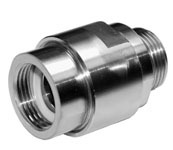 For use in mechanical engineering/robotics for hose lines and pipelines that are subjected to constant movement. DN 25, DN 40 and DN 80. DN 25, DN 40: PN 25. 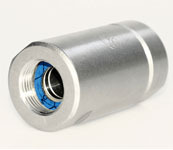 Double-row torsion protection that can be fitted along the line. 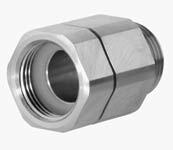 Especially developed for use with steam and hot water - with steam proof seals and is suitable for the high proof pressures in steam hoses. Torsion protection that can be fitted along the line with integrated solids stripper – for use with liquids containing solid matter. 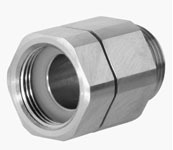 Torsion protection with double ball paths that can be fitted along the line – to be used in all situations where process-related higher lateral forces are exerted on the swivel joint, such as in pipelines. DN 20 to DN 100. FPM, FEP, NBR, FFKM, EPDM. 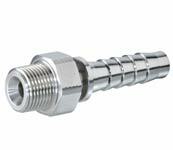 The patented RS ball swivel joint is designed to prevent damage to hoses caused by torsion and kinking. By allowing an angle of up to 50° between the two sides, the joint permits hoses to go around a corner without excessive bending. DN 25 to DN 100.